Saturday, April 27, 9:00 am. Meet at Mosswetusset Hummock Parking Lot, E. Squantum St. 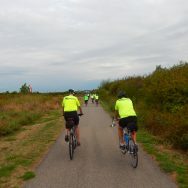 Explore Squantum, Marina Bay, Billing Creek Salt Marsh Trail, and the Quincy River Walk with us and discover connections to the MBTA, Squantum Point Park, and Marina Bay. The 2019 Neponset River Watershed Association Spring Cleanup is also on this day April 27. Each year there is quite a bit of winter storm debris from the Neponset River Bridge to Squantum Point. Volunteers are needed from 9 am to noon to help clean the shoreline and walking/cycling paths in Quincy. Tools, gloves, and light refreshments are provided. DCR trucks will help collect filled garbage bags and large pieces of debris. Join a clean up crew after our ride! More information here.